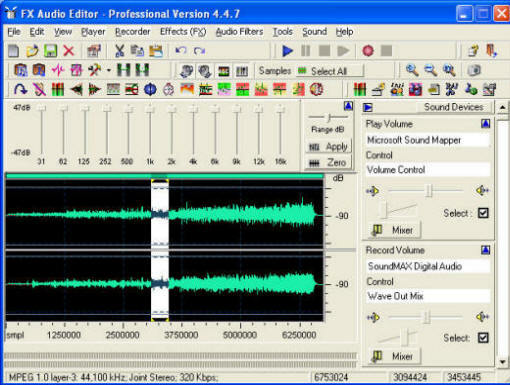 Whether you are a serious audiophile or you just want to quickly rip a CD or convert between digital audio formats, Fx Audio Editor can do the job for you. With Fx Audio Editor you can visually edit, convert. play and record most sound file formats, rip CD's and save as WAV, MP2, MP3, VOX, WMA and most other popular audio formats. Add special sound effects and filters. Slow down those chipmunk voicemail files and save them so they can be played. ...... Slow down those chipmunk voicemail files and save them so they can be played back with any standard audio player. Qweas is providing links to Fx Audio Editor Series 4.7.13 as a courtesy, and makes no representations regarding Fx Audio Editor Series or any other applications or any information related thereto. Any questions, complaints or claims regarding this application Fx Audio Editor Series 4.7.13 must be directed to the appropriate software vendor. You may click the publisher link of Fx Audio Editor Series on the top of this page to get more details about the vendor.